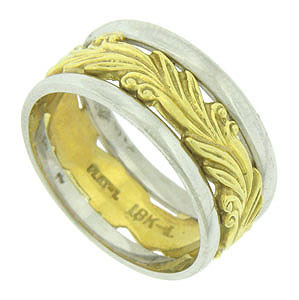 Bold, deeply engraved leafy vines curl across the face of this antique style wedding band. The 18K yellow gold figures are held by a pair of softly faceted platinum bands. 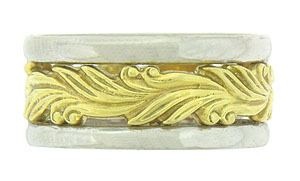 The brightly polished wedding ring measures 8.32 mm in width. Size 6. We cannot re-size.